White, soft, glistening in the sunlight like diamond dust. Serene, silent, muffling the sounds of the garden. It covers the garden, hiding it, blanketing it with comforting insulation. It reveals the faint foot prints of rabbits, the scratch of the birds huddled under a spruce tree, the trail of a gardener walking about for no reason in particular, except to see the beauty of a wintry scene. Thickly spread on the driveway that is just a bit too steep. Heavy, wet, hard to move snow. It traps me inside, waiting for someone, or spring, to dig me out. I begin to dig with a snow shovel. I blow snow off the drive with a small snow blower, then watch helplessly as the snow plow whizzes by, dumping a Mt. Everest high pile of snow at the foot of the drive. I begin to dig again. But this year, let it snow! This year, Troy-Bilt will be sending me the Storm 3090 XP snow thrower to scale my wintry Mt. Everest at the foot of the drive and in exchange I’ll tell you all about it in a future blog post. Let it snow! I’ll be ready. 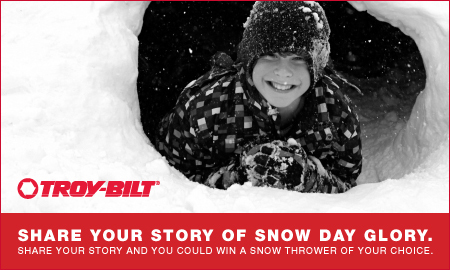 Would you like to win a snow conquering snow thrower from Troy-Bilt? Troy-Bilt is sponsoring a giveaway of either the Storm 3090 XP 2-stage snow thrower or the Flurry 1400 for one lucky winner, your choice! 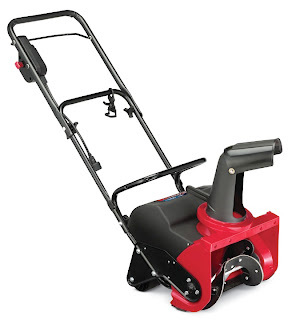 Tweet this contest by copying and tweeting “Enter to win a Troy-Bilt snow thrower on @Indygardener blog http://ow.ly/3bCcB " and then enter your name a second time by leaving another comment. If you have a Kindle reader, sign up for a free 14-day trial subscription to the May Dreams Gardens blog and enter your name again by leaving another comment. That’s a maximum of 3 entries per person. Don’t even think of cheating and entering multiple times without doing the above, or you will be disqualified! All entries must be submitted by 9 pm EST, Thursday, November 25, 2010. The winner will be chosen shortly after that from all entries by using a random number drawing. I will notify the winner via email and then announce the winner in an update to this post. This giveaway is open to US residents only; must be over 18 years old to enter. Winner will choose which snow thrower they want. If the winner is uncertain about which one will work best for their conditions, Troy-Bilt will be happy to suggest one based on location, amount of average snow, length of driveway, etc. Update 11/25 - We have a winner! It is commenter number 43, "Aunt Tina". Congrats, Aunt Tina! For those who didn't win, there are three other blogs still hosting a giveaway for a Troy-Bilt Snow thrower until Dec. 2nd, 2010. Please visit them to enter again! Good luck to all on another chance to win! I have many fond memories of sledding, building snowmen, snowball fights, and best of all snow days growing up in CT, but the one that stands out the most in my adult mind is the Blizzard of '96. I was all of 21 years old and working at my first grown-up, but very junior, job as an administrative clerk -- that's one step below the receptionist in case you were wondering. I was still living at home and commuting the 10 miles or so to my office. You become inured to the weather forecasters predicting huge snowfall when you live in southern CT because you seldom see more than a few inches and most of us can deal with that, but this storm hit overnight and it hit hard. We woke up to several feet of snow and it didn't show any signs of letting up. I couldn't see my car let alone the street. Just then the phone rang, it was the president of the company paying me $7.25/hour. "Hi Heather, we're calling everyone at home to let them know we're closed today." I just said okay, thanks for letting me know, but I was thinking: Really? The governor has declared a state of emergency and ordered all non-essential workers to stay off the roads. I really thought that I was going to make it in today. Of course, if I had Troy-Bilt Flurry 1400 to dig out my car and the 10 miles of roads to the office I might have! I have fond memories of sledding with my kids when they were all less than 10. We would go over to my in-laws and sled down “the hill”. The tough part was climbing back up. One year the the whole neighborhood kids and adults had a huge snowball fight, and then hot chocolate with marshmellows. Wow, it was already 4 years ago that I joined our neighbours to build a very large snowman, while our kids played happily together. That was a fun evening. My memory would be when I was in 8th grade. We had a HUGE snow blizzard that came and in a matter of 2 days had so much snow that school closed down for 2 weeks and the roads in town were closed off for over a week. They had so much snow that people that were clearing the streets just shoved it to the side because they had no where to put it. The kids like me had a blast with all that snow..Snowmen, snowball fights, igloos were everywhere!! So much fun.. I remember as a kid playing out in the snow and making an igloo with my older brother. It was big enough to hold 4-5 of us. It was so cool. One of my favorite memories is going sled riding with my brother in a nearby park. The park had the perfect hill and all the kids in the neighborhood would sled ride on this hill. It was great. Thanks so much for this giveaway. What a wonderful prize. I love to sit in the living room and watch the snow fall in lazy circles by the window. I love snowball fights with my kids. My favorite snow memories are from when I was a little kid making snowmen with my mom and dad. Also sledding down our driveway with my sister. I don't need to shovel since my 'driveway' is actually a town road, and the plow has to turn around here, so I usually even get a parking space plowed. I am hoping for lots of snow (not ice) because we need all the moisture we can get. Best memory has to be my first time skiing in NY with my family. Hard to believe that was nearly 20 years ago. Sledriding for the first time with my son. He's fearless so it was so fun! I grew up in the mid-Atlantic states so we had very little snow when I was a child. However, my freshman year in college, we had a blizzard in Boston! We were snowed in for a week. What fun (of course, I didn't have to shovel or drive in it)! I grew up in central Ohio and we always had snowy winters. Our neighborhood was edged by a large woods filled with great sledding hills. I remember one year getting a ton of snow - so much that school was closed for 2 days in a row. The neighborhood kids - from ages 6-14 LIVED in the woods during those days. We built snow forts, had epic snowball fights and of course sledded all day long; we even built ramps for the sleds to have jumping contests (it's amazing no one got hurt). Every few hours someone's mom would start shouting for us to come in and we'd all trudge home for hot chocolate and lunch. Then we'd all meet up again later that afternoon. It was truly a winter wonderland and one of my favorite childhood memories. What's not to love about SNOW???!?!?! I seriously love snow. I can't wait for this cold rain to turn into snow. It is so beautiful and peaceful. I am a huge skier so most of my snowy memories take place on the mountains of Colorado, Utah, and CA and the hills of Ohio, PA, & New York. But I remember as a kid, sitting at night in our enclosed porch with windows all around and the lights all turned off except the big spotlight in our backyard. I'd sit and watch the snow gently fall down from heaven, praying for a snow day the next day. When we were lucky enough to have a day, my parents would have to drag me in from build snow forts, having snow ball fights, and I even loved shoveling it! Now that I am older I still love to ski and play in the snow, but my back doesn't love the shoveling so much so please pick me as your winner. Thanks! SNOW! A love/hate relationship with me. Nothing brings a smile to my face any quicker than looking out the window to see it snowing and the ground is already covered. Love it! Then, I look at my driveway, ugh! Hate it! Don't get me wrong, I LOVE the snow, AND I really kind of like getting out in it to blow it off with my snow thrower. The "HATE" part comes (and I know this happens to almost everyone) when "the guy" plowing your street piles up a 3 foot drift of ice and packed snow at the end of my driveway. Two years ago, after a very heavy snowfall, I went out to clear my driveway. The "guy" plowing our streets was, in my opinion, done! He goes past my drive 3 or 4 times and each time the pile at the end of my driveway gets higher. Now, I'm not unreasonable, I understand he is clearing the street and he can't worry about every driveway he's blocking - that's fine, OK, I get it, and I'll deal with it when I get to that point. So I proceed and after about an hours work, it's done all the way to the street, cleaned up the pile the "guy" made and I'm feeling pretty good. Then, as if on cue, here comes the plow guy AGAIN making ONE LAST pass down the street and as he passes my freshly cleaned driveway scrapes another big pile right where I just cleaned it. Well, I almost "lost it"! I yelled at him, "HEY! You just saw me clean all that stuff up, what are you doing?". He says, "Sir, we can't clean out individual driveways.". I said, "I don't care - YOU CLEAN THAT UP RIGHT NOW! You saw me struggle to clean up the first mess and then you make another pass and intentionally block in my driveway again; now CLEAN IT UP!". My family moved from Oklahoma to Minnesota in 1986. The winters were mild, but still brutal for us Okies, until 1991. The Twins were on to their second World Series win, and I felt like I belonged, especially with ticker tape parades in school hallways. That Halloween began with a dusting of snow, and when we woke up the next day it was approaching 30". Heaven? Delusional disbelief? Yes! Surviving--and enjoying--that snowfall made me a Minnesotan, and my often-ridiculed southern accent seemed to finally melt away inside the cold snow fort we built, which was the size of a small house. Minnesotans, no matter where they end up (like Nebraska), embrace and thrive in the snow--so bring it, Troybilt. Bring me home. Let's play. Let me start by saying that I hate snow! Winter is my least favorite season! :-) But, I have lots of fun memories from when I was a kid. My favorite up until now though was from last year. We got a lovely snowfall over the Christmas holiday. The snow made driving a nightmare but the snow was perfect for building a snowman. So, on Christmas night, my husband and I built a huge snowman in our front yard for all the neighbors to see (funny because we don't have kids). It was there, slowly melting away until April. The neighbors loved it! One of my fondest memories is taking my dog out to play in the snow. He loved every minute of it. I am sad we won't be able to do it this year. The first Thanksgiving we lived in this house we woke to a heavy snow. Our guest were calling to cancel coming out for diner because they didn't want to navigate our long country driveway in the snow. We heard a noise outside and a neighbor from down the road was out plowing our driveway for us. We had never even met the man. When we went out to thank him and offer payment he just smiled and said "Welcome to the neighborhood!" We made rapid phone calls and most of our guest made to trip out for dinner. We used to have a snowblower when we lived in Indianapolis once before. When we moved to North Carolina, the movers were unloading the truck with our possessions and were standing around looking puzzled at the snowblower. They asked what it was. We told them and they couldn't believe that we lived in a place where we got enough snow to require such a machine. Now that we are back in Indianapolis, a new snowblower would certainly be helpful. I grew up partly in Alaska, and the military used to have these enormous screw plows that would send gigantic arcs of snow that were just right for building snow forts. The best memory of snow is having a snow day from school! I don't enjoy the cold that comes with snow but I do enjoy shoveling (or blowing) the snow so that the driveway is clean before I drive a car on it! Early morning... Boxing Day a few years ago... coming back from Christmas with the Out-laws. Here in New England it snowed so hard it was up to my arm pits... which is saying something since I'm 5-10. Fought our way in... quickly fed the cats and off to work. Spent the day dreading all the shoveling we would do. Home... WOW! I HAVE THE MOST AWESOMNEST NEIGHBOR IN THE WORLD! Yes... he took his snowblower and blew out my entire drive. MERRY CHRISTMAS! Well... I still don't have a snowblower (pick me!!! pick me!!! ) but I do rake his leaves. ps: do the garden fairies go south for the winter? I remember riding a toboggan down a large hill at a local golf course when we were young. It was so much fun going down (walking back up - not so much). The blizzard of 78. Missed school for weeks and our house in the country had a drift in the back that went all the way up to the roof! But .... Many of our snow days over the years were full of board and card games, hot chocolate and toast. Once the shoveling was done we'd get dried up, put on our sweats or pj's or sweats,thick fluffy slippers on. Lots of laughs and teasing. Luckily none of us was ever competitive so the games were a blast. When we lived with my mother for a few years, my brother would often drive down, just to get snowed in with us! Once it got late, we'd sit by the large front window and watch the show continue to fall. I miss those times! Now he works with emergency services, and I have a job that no matter what, I have to be there. But at least we have the memories! The first snowfall is always exciting each year, but my specific memories seem to be negative ones--getting stuck in the snow or driving through a blizzard. And yet there are a lot of happy memories--making snowmen with the kids and now the grandkids, walking through the snow with Sophie, a snowfall on Christmas Eve... Probably my favorite times, though, were waking up in the morning after a snowfall and hearing that schools were closed for the day! When my son was small, we hardly got enough snow to do anything with and I remember how much he yearned for a good one. One year, we finally got it and we all went out and built a big, really big igloo. He had so much fun with that and that is my favorite snow memory. Thank you! When I was a little girl it snowed for a month straight. All the adults complained constantly, but me and my sister had a blast building snow forts. My fondest memory of snow is when I was about 10 and we had alot of snow. We all used to sled down the hill backwards. It was loads of fun and afterwards Hot Chocolate time. My favorite snow memory is taking our kids up sledding on the hill near the grade school. We all had a blast. I remember the Blizzard of '78 here in Indy and a very (very!) heavy snowfall when I lived in Colorado and there was almost 3 feet of snow in the street in front of our house. Would have been nice to have had a snow blower on both occasions. Having grown up in Oklahoma, snow was a rare and slight occurrence. My first real experience with SNOW was moving to Denver, Colorado. There were two blizzards in one week. The first slowed down the town. The second, shut it down completely! I love the snow! My favorite snow memories are sledding down this big hill at my grandparents' house. All four of "us kids" would pack ourselves into a sled and go full speed ahead barreling down the hill! We had to be careful not to veer to far to the left, though, because there were sticker bushes- and not too far to the right, because there was a pond and well! : ) Afterwards, my grandma would make us old-fashioned hot cocoa! I hope my children enjoy winter as much as my siblings and I did! Favorite snow memory is when my husband and I were just dating. We got stuck on a major highway on ramp in the snow and had to get out and push ourselves out of it...talk about a bonding experience! My favorite memory is when my husband was teaching me to drive in the snow. He picked the steepest hill he could find, during 13 inches of snow, new years eve in a Triumph of all things. He threw it into a spin, spun down the entire hill and came to a perfect stop at the bottom. He looked at me and said "that's how you stop from a spin". I could have killed him. I always loved getting up early in the winter if a thought it was going to snow to see if school was cancelled. We always were able to get out of school for a day or two if it snowed and that is a great thing about living in the south. We would go hunting or sledding and ride 4-wheelers all day. My favorite snow memory is cross country skiing in Oregon. My father-in-law, husband, kids and I went up Mt. Emily in January. The weather was crisp and cold. My father-in-law taught us all to put on our skis, stand up using the poles, and how to ski across the beautiful countryside. My daughter kept falling. No matter how hard my father-in-law tried, he could not teach her to help herself get up. It was a beautiful day. I remember being at Purdue and having lots of snow. At night it was so quiet and peaceful, walking across campus. Snow and darkness go together. My favorite snow memory is as a child surveying the silent beauty of the glistening blanket of white covering the world broken only by my footprints and the miracle of the occasional burst of color in the white from a cardinal at the feeder. Snow days from school to enjoy the winter were filled with anticipation and excitement and a day filled with building snowmen, getting red with cold and enjoying hot chocolate in the warm house. I remember our puppy in the snow because we got him the winter. He left his puppy tracks in the deep snow, he rolled and tumbled in the fluffy snow, and he ate the ice cold snow! Then he would run over to me then jump and cover me with more snow. In March of 1993 I was in college in Virginia, headed home to visit my parents in Upstate NY. The train (10-12 hours worth) was cheaper than an airplane, so I reluctantly chose that method of transportation. Good thing, too, as a freak late snowstorm hit the mid-Atlantic, closing all the airports. My train left Charlottesville early in the morning, on time, and plowed through the snow to NY. Had to change trains in the city, and the snow was so bad we weren't sure if the next train was even going to leave. It eventually did, and chugged north. And the snow kept falling. Eventually the train stopped. One stop and a mere 20 miles from my destination, but the train could go no further. Everybody off. Except we couldn't go anywhere. All the roads (and bridges across the Hudson River) were closed. We convinced the people in charge to let us back on the train, where we spent the night. By morning the highways and bridges were open, but local roads were not. My parents spent the early morning on the phone with the town and told their sob story of their teenage daughter being stuck on the train - couldn't they please get their neighborhood plowed? The town obliged, and sent a plow to lead my dad out of the neighborhood and to the highway. 27 hours after I got on the train in Virigna, I arrived home for "spring" break. My favorite snow memory was this snow day back in elementary school. We would have them occasionally for no reason, but this time it was a blizzard. We wanted to go outside and play, since we had the day free. We went outside and lasted all of 10 minutes in the blowing snow. Back inside for hot chocolate. my favorite snow memory is from a few years ago when we got a ton of snow we got stuck in our neighborhood for about a week. no school, no work, no going anywhere!!! our whole neighborhood not only have a giant snowball fight that put shame to any community snowball fight but we also hooked everyone up with the missing food items they needed each day, since no one could get the store, and we have a snow blower, so we lent it out to several people to help them, too bad it broke last year though, wamp wamp wahhhhh. I remember when I was young and we had a lot of snow, everything was cancelled and we couldn't get out of our street for 3 day's it was so much fun being off school and playing in the snow! Year after year, my favorite part about snow...is snowball fights. Something that falls so daintily from the sky can then be packed together and hurled at your target. Free and readily available! And mom can't get mad right? I mean, it's just snow! My fondest memory is while growing up going sledding at my grandparents house. They had a huge hill and my siblings and I would pile into a long sled and ride down altogether, trying with all our might to increase the speed of the sled while simultaneously doing our best to keep ourselves and one another in the sled. There were 4 of us, so this was quite a challenge. There were always good laughs and hot cocoa with our grandparents to top off our memorable adventures. I have definitely seen some ugly jewelry in my life. I saw this one lady wearing a turqoise that was the full length of her finger. In my opinion it was hidious. Living in Upstate NY, I have lots of snow memories! Probably the most memorable is the Blizzard of 93 in Syracuse, during which 42.9 inches fell on the city within 48 hours, with 35.6 inches falling within the first 24 hours, and school was closed for a whole week. Being in high school, I was in my glory! Thanks! Just shoveling the driveway last year and starting a snowball fight with my beautiful wife of 32 years! Two years ago we had a big blizzard. My kids were on the bus on there way home from school and their bus got stuck. My neighbors had decided to get in their cars and try to drive and get their kids, but all of their cars got stuck down the street. I decided to put on my snow boots and bundle up and walked to go get the kids. The snow was past my knees. I ended up getting all of the kids.It was a day to remember. My favorite snow memory is the blizzard of the 70s. I was supposed to get my driver's license that day. i was pretty sure Mom conjured that snow to prevent me from getting it! I do love to be snowed in. An unexpected free day without pressure! My favorite snow memory was the 1st time I took my daughter out in her first snowfall! Last winter it was pretty with all of the snow, except when I couldn't walk on the sidewalks uptown because no one shoveled them, as I always make sure mine are clear. When I was little I used to build amazing snow forts. My parents live out in the country, and we had much harsher winters when I was younger. My dad would plow the driveways with his big tractor and push all the snow into mountains. Then I would set to work building snow block walls, stockpiling snowballs to drive off attackers, and digging escape tunnels in case the fort was over run. Lots of fun. Thank you for the chance to win. Not sure this is my favorite, but I remember when I was in High School and we had a blizzard coming it was lunch and we new school we getting sent home, so I ditched school because I had to walk home like almost a mile, I tried to run it but the snow was so deep and the wind was blowing in my face, it sucked! I remember when it was over my sisters and I going and making a huge fort. once year we got snowed in my gramma and granpdpas. we had kerosene lamps and gramma cooked soup on the woodstove. i felt safe and warm and i was sad when my parents were able to get us two days later. When I was a kid one year it snowed so much you could walk onto the roof of the house (1 story) and I thought that was so cool. Remember that scene in A Christmas Story where the kids are so bundled up that they can't even move? That was us. My mom would put mittens on us then two pairs of knee socks over the mittens and up our arms to keep snow from getting inside our sleeves. Sweaters under our coats. Hats, scarves. We looked like the Michelin Tire Man but we still had fun. I remember having snow ball fights with my sister outside. My favorite snow memory is the first time my husband and son made a snow fort together. We live in Maine and have snow all winter, and they worked on that fort for a solid week. It was a work of art, and now they have a yearly tradition of building a fort together. My favorite snow memory is when we first moved to MN and I took my 5 year old daughter sledding for the first time. Something I will never forget! We used to go ice fishing with my grandpa and I remember packing a bit thermos of hot chocolate for me, just like their thermos of coffee, and sitting outside in the snow for hours and hours having a blast..I will be out playing and he would call me when the tip up went and I would come flying across the ice! Oh, boy! My favorite snow memory is of the first time I took Bebe Boy James on the toboggan run! He always wanted to ride roller coasters, but he was too small, so this was the next best thing! It wasn't too cold (about 35 degrees, which isn't too bad when you're bundled up and you have a heated chalet next to the run where you can take a break with some hot cocoa with marshmallows). He screamed like a crazy person when we were going down, and it seemed that he really didn't like it. I thought he was going to try to climb out! BUT once we got to the bottom, he climbed out and immediately turned to me and said, "That was fun!! Can we do it again?" Now I'm not a winter and cold type of person, but we ended up at the run for about 4 hours. I loved how much fun he was having and after about 3 times or so, he wasn't screaming on the way down; he was laughing. My favorite snow memory was when I was around 8 years old. I built a snow igloo with some family members and I remember thinking it was the COOLEST thing ever. Now I hate snow though. haha. My favorite snow memory is letting the puppies out every year during the first snow. Our lab loves to catch snow balls like tennis balls, and even though he's getting on in years, will still jump high into the air and do flips to catch the frosty flying balls. Our other dog loves to roll in the snow and dig tunnels (sadly we have plenty enough snow for him to make real tunnels in). Of course, the third one sits there with a pathetic look on his face, which is just as funny as the other dogs' antics. My favorite memory is when I was 10 my mom and dad let me stay home and play hookey. We went sledding and built a snowman and snow angels, and just had a great day together. I have two sons ages 10 and 7. We have a really big hill to sled ride down and the boys were outside sledding. Little did they know, their papa was on the front porch video taping them as they went down the hill. My oldest son got all situated on his sled and as he started going down the hill, all you hear is him screaming "oh sh*#!!!!!!!!!!!!. Later we showed him and his brother the video which was taken and we laughed so hard. He was so embarrassed. It was really cute. My favorite snow memory was in 2005. I live in Maryland and we got about 5 feet of snow, we couldn't even open our front door! Everything was at a stand-still for about a week and no-one had to go to school or work. I loved the time off and spending it with my family. (Snowmaggeden was fun too! ;)) Thanks for the chance! My favorite snow memory is from childhood. We had a blizzard which knocked out all power and my parents and all seven kids camped out in our living room where we had a wood burning fireplace. What an adventure for the kids and I'm sure a nightmare for our parents. To make the experience even better - no school for days, just hours and hours to play outside in the snow and skate on the creek that ran through our yard. My favorite snow memory was last year. My son's birthday is on Dec. 22, so we always schedule his party for the weekend before Christmas. His party got snowed out - we had inches and inches of snow the night before. I cried, but he didn't care in the least. He was just excited to bundle up and go play in the snow. We all went outside, including the dog, and played. Then we came in and had hot chocolate and chilled out all day. I always looked forward to snow and the opportunity to make snow cream. Living in the south and on a farm provided open spaces and clean white flakes to ensure a family delight. We used to love being pulled behind the four wheeler on our sleds when we were little..so much fun. One of my favorite snow memories was when I was younger and we had gotten a dog for the holidays. He was about a year old and we had a blizzard. I just remember him disappearing in the snow...he wound up being a best friend for years to come. I remember going sled riding down a hill out back of our house. All the neighborhood kids would come because it was the only hill around. Then, after playing and sledding for a while, I would come in and my mom would have hot chocolate waiting for me! My favorite memory is the week we purchased our home and had our first bonfire with friends and family out by the creek, and it was snowing! Beautiful night! As a kid building a snowman and sledding. Hundreds of people having a snow ball fight in the Oval at Ohio State. Looking back, it seems like a giant lawsuit in the making. I wonder whether it's happened recently. Every year I help my boys make snow forts. A couple of years ago, I even broke down and bought myself a pair of grown-up snow pants so I wouldn't have to kneel on cardboard or plastic bin lids! My favorite snow memory was the Christmas snowfall that snowed us in at my sister's house one Christmas Eve. We went there for dinner and ended up staying all night. We went to open the front door after dinner and all there was was a wall if snow & ice. I live in the the Northeast, where we get lots of snow, so I have lots of snowy memories, some good and some bad. I guess the best ones are when I was a child and we loved it when it snowed, we would go sliding with our sleds on the hill behind our house, or else build snowmen. I love the Troy-Bilt Flurry 1400 snowblower, it's just what I need for my driveway. We lived in south Florida for 18 years so when we moved to Michigan and saw our first big snow it was simply amazing and is easily one of my favorite snow memories. My favorite snow memory is going sledding at my Grandpa's house with all of my cousins. We had so much fun! Winter of 1964 I was 12. We had 6 inches of snow in southern Ohio. Back then school wasn't closed for anytype of weather. When the snow came they just put chains on the school buses and plowed through. This one occasion the driver ditched the bus. All the of older boys ,8-15 years old had to get out and push. With tires spinning and mud and snow flying we could hardly be reconized with all the with all the mud and snow that was thrown on us. The whole school got a good laugh out of it. And yes we had to wear those wet and muddy clothes all day. I remember several snowless Christmases in a row, followed by one perfect snow Christmas morning. We all ran out and made snow angels! Thanks!! My fave snow memory is from when I was growing up...each year that we got enough snow we would trek to the neighbor's hill and sled all day..and I do mean ALL day lol! We only went home when we were completely frozen.. I favorite snow memory was when I was in the 5th grade. It snowed so much we had a snow day from school. Usually when we had a school snow day my parents had to still go to work, but we got so much snow that they couldn't get to work. I really enjoyed spending an extra day with my parents. We played games and built a snowman outside. A favorite snow memory happened just last winter when I spent several hours sledding with my sons at a local park, then returned home for hot cocoa. It was just one of those golden days when everyone was happy, the snow was jusst perfect for sledding, and no one got hurt or angry or fought or fussed. A really nice afternoon! last year when we had 18 inches of snow my kids and hubby&I had so much fun playing in it! My memories are of being with friends when we were kids and sledding all day at a neighbors who had a huge hill!! My favorite snow memory is when my son was a year old. We went to Michigan's U.P. and practically got snowed in. My son was barely walking but he loved it!! I grew up in Texas and moved to the "Snowbelt" of Ohio a few years back.(Ah! The things we do for love!) I have learned to love the snow if I can stay inside and make bread all day instead of braving the roads. Perhaps my most memorable experience is the first time I tried to sled and I fell off on this big hill and rolled down! I felt like i was re-living my childhood, but this time with snow! My favorite snow memory, and growing up in Michigan I've had many- happened when I was about six years old. Today, I am 53 years old, where does the time fly ? School had been canceled for a snow day, a result of a pending storm and I was thrilled! My brother and I sat our selves down in front of the tv and looked forward to a day of being couch potatoes. My dad had a fit and pushed us outside to play. He couldn't imagine children not enjoying freshly falling snow. And once outside we did enjoy the snow. We built an entire snowman family, complete with a "doggie snowpup". The local paper came and took pictures! !Way cool. Today my dad has passed away and I can't tear my kids from their computer and viedo games. I'm not a big fan of snow - never was even as a kid, but I have a great video of my kids and hubby having a snowball fight from behind their forts they built and they are just laughing and laughing. Such joy! I remember how everyone used to get sleds and head to a big hill near my home. We would sled for hours no matter how cold it was.Finally with and little icicles clinging to our cold ,wet clothes we would head home for hot chocolate. Why is it I lovedthe snow so much back then but now can't wait to get it shoveled away. I could really use a snowblower to help with the task.AND i am already dreaming of May. I was living in Southern California and hadn't seen snow in ages. I was in Washington, D.C. on business and it started snowing. I looked out the window of my hotel room and the snow was absolutely beautiful. Of course, I wasn't happy the next day when I was freezing in my fairly light weight SoCal jacket. I remember as a kid, using a cool whip bowl and scooping up snow and packing the bowl to make a fort.. what fun times! I remember in college it was snowing at like 2am and about 20 of us went outside to the basketball court and had a snowball fight. Then we came inside and the boys threw me in the shower on their floor and wouldn't let me out. Ahhh... the good old days! I absolutely love the snow. One of my best memories is getting snowbound when I was visiting New Zealand. Nothing could get in or out of the small town we were staying in, and everyone had to walk from place to place. We all walked to the local tavern and had a great night of meat pies and good beer, along with fun games of darts. Then at about midnight we went out and had a huge snowball fight. The first snow I remember was 3 decades ago. It snowed so hard that there was 4-5 feet of snow on the ground. My mom and dad still have pictures of it. My favorite snow memory is from when I was a child in 1977. Michigan had a huge blizzard and it snowed heavily for several days so school was cancelled for an entire week. Once the snow stopped we were able to go outside to make a really huge snowman and have snowball fights. My sister and I thought it was great, my parents, not so much. I remember when my friend Kayla and I would play in the snow. We would always try to make "ice forts" but they never worked! It was time though. Thanks!